The Rage Spirit of St. Louis: Comes Ready-To-Fly and has great looks. Follow along as I discover what this plane is capable of! The Spirit of St. Louis is an airplane most all of us are familiar with, and it played a pivotal role in long distance flight. As a matter of fact, it was the first airplane to complete a solo, non-stop transatlantic flight! 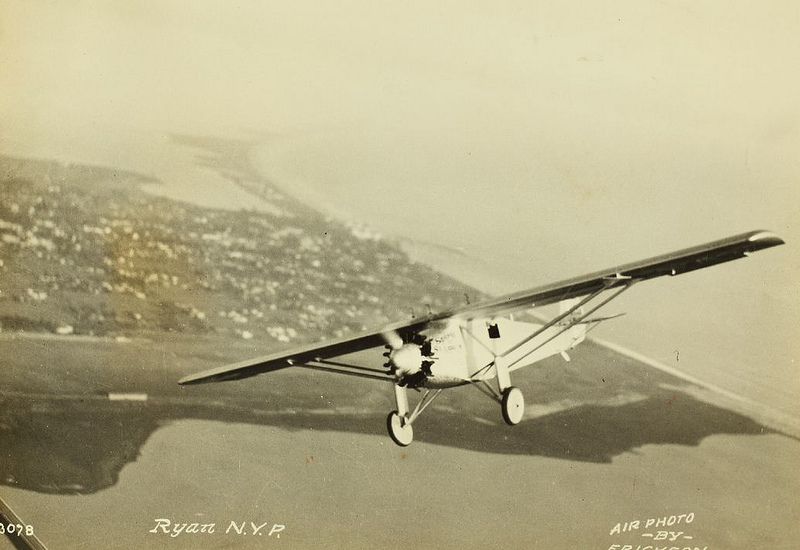 Covering roughly 3600 miles in 33.5 hours, Charles Lindbergh flew the specially built Ryan NYP from New York to Paris in May of 1927. N-X-211 and its pilot earned a place in aviation history, and in the hearts of aviation enthusiasts for decades to come. Rage has introduced a micro Spirit of St. Louis that we can all enjoy. Follow along as I take a look at the unique airplane. Packaging functions as storage and carry case eliminates hangar rash. There is ample power and control response, so it takes a bit of a light touch on the sticks to get that "scale look." However, having a bit extra comes in handy when the wind picks up. My test flights were on a windy day and I had no problem getting the Spirit to go where I wanted it to. I did discover that a blip of throttle before adding rudder made turns look and feel better and I also noted that if you were dealing with wind, you may need to add a touch of down elevator in turns. I suspect this was due to the turbulent air coming off the tree line behind me at the local park, though. The Spirit is a lot of fun to fly and it really looks great in the air. I loved setting up for a fly-by at about head height and just "watching" this one come by. With all the added detail we don't normally see in an RTF micro, this one stands out and for me, makes this plane even more enjoyable. Flight times were on the order of 6 1/2 minutes with mixed throttle and there was some juice left to spare when I landed. I didn't have a suitable smooth surface to attempt a "rise off ground takeoff, but that wasn't a problem. The Spirit hand launches quite easily. With the throttle between 3/4 and full, a light push is all it takes to get in the air. Even with a bit of a breeze, the Spirit had no problem establishing a positive (and quick!) rate of climb. Landings are pretty much uneventful, just mind the wind, and be ready with the throttle to make corrections as needed. It will "plop" down in soft grass with no worries at all, making it ideal for a quick flight at the park. While the full scale was designed and built to complete a single task, this one has the ability to do a bit more than cruise around. You can loop it quite easily, thanks to an abundance of power, and if you are smooth on the sticks, you can coax a roll out of it, though it's more of a barrel roll than a true axial one. However, I think the real beauty of this plane is in simply flying it and watching it. On a calm day, when you can relax and enjoy the flight, it's very easy to get lost in the way the Spirit looks as it passes by, and it's easy to imagine yourself in the cockpit, crossing the Atlantic, with your heart set on the $25,000 prize that awaits a successful landing. Is This For a Beginner? In my opinion, no, not for a first ever airplane anyway. While it is a great flyer, you do have to be mindful of the amount of input you give it. For a second plane, and a first scale type aircraft, I think it would be just fine. Small size, great detail and being easy to fly make this airplane a winner for me. Couple that with ample power and responsive controls, and you get a plane that can be flown in a mild breeze, instead of having to stay in its box. It looks good in the air, on the ground and it's easy to transport. I'd say Rage has a winner on their hands. RCGroups.com review items are provided by hobby manufacturers and suppliers, some of whom may be RCGroups advertisers. Review products are sent directly to independent reviewers, chosen by RCGroups.com. RCGroups.com reviewers are not compensated by either RCGroups.com or the reviewed item's supplier. However, they are allowed to keep the review items at no charge. Published reviews reflect the opinion of the author. When a conflict arises between a review sponsor and a reviewer (which is rare), RCGroups attempts to work out a satisfactory solution for all parties. In some cases, this may mean that a finished review will go unpublished, or be subjected to editing for technical accuracy. RCGroups reserves the final say as to whether an article is fit for publication. It is always our intent to provide a place for honest and open commentary, and to put the needs of our visitors first. If you feel that something we've published is inaccurate, please let us know using the contact form. Last edited by IFLYOS; Aug 11, 2018 at 01:13 PM.. I was thinking of giving this Ryan NYP a whirl. Seen it @my LHS. Other than the +2 dihedral, it’s nice. Last edited by Bell47G2; Aug 17, 2018 at 01:40 PM. Is the wing undercambered or flat-bottom? Don’t quote me Rampage, because you’re the LAST person in the world I want to be incorrect with, but I THINK it’s a VERY slight undercamber, going by the shape of the bottom of the wing ribs in the photo provided. Last edited by Bell47G2; Aug 18, 2018 at 06:27 PM. The actual aircraft had anhedral, one of its most distinguishing features. This model therefore looks extremely un-scale and thus stupid in the eyes of anyone truly knowing and truly loving scale aircraft! Actually, with a high wing anhedral gives the greatest response. Figuring the correct amount for neutral stability isn't hard, but i wouldn't recommend doing it for, again, two reasons. One, a little positive stability is a good thing, and two, it would be almost as bad from a scale standpoint as your Vee tail. So build the wing with ailerons, but leave it flat like the original Ryan NYP. Did you know the Spirit of St Louis was built by Ryan, and the type designator was NYP? Now you tell me why it was called NYP. Last edited by xlcrlee; Feb 26, 2019 at 11:20 AM. The "Spirit" was one of my first Lego kits, so it will always have a special place. Nice to see it being so nicely captured in UM form. The actual aircraft had anhedral, one of its most distinguishing features. While it is true that the original aircraft was laterally unstable (at Lindbergh's insistence), this was not due to anhedral. Even the source you posted agrees that the wing was flat! This model therefore looks extremely un-scale and thus stupid in the eyes of anyone truly knowing and truly loving scale aircraft! This model apparently doesn't come with gyro stabilization, and Lindy isn't sitting inside. So compromises are necessary in order to make it fly well. It's interesting to speculate whether a different pilot than Lindbergh might have requested dihedral be added to the full scale!